Interest rates are also an important determinant of farm financial performance. A large proportion of farms carry high levels of debt and many were affected by the large rise in interest rates in the late 1980s and the large falls in the rates since 1989. Interest rates change will affect farm incomes directly. By changing the size of interest repayments and indirectly through any changes induced in the exchange rate. Interest payments make up about 11% on average of total farm cash costs. However, there is a large variation in debt between farms. For example, 25% of all broadacre farms had debts of more than $141 000 in 1991-92 and 12.5% carried debts of more than $271 000. On the other hand more than 25% carried no debt in 1991-92. In the study it was found that the farm incomes in the intensive cropping regions and the northern beef pastoral regions are the most affected and the incomes of sheep pastoralists and those farmers in the high rainfall areas are the lest affected. Other areas where incomes are greatly affected by interest rate changes include the high rainfall areas in the south eastern corner of SA and in western Victoria. 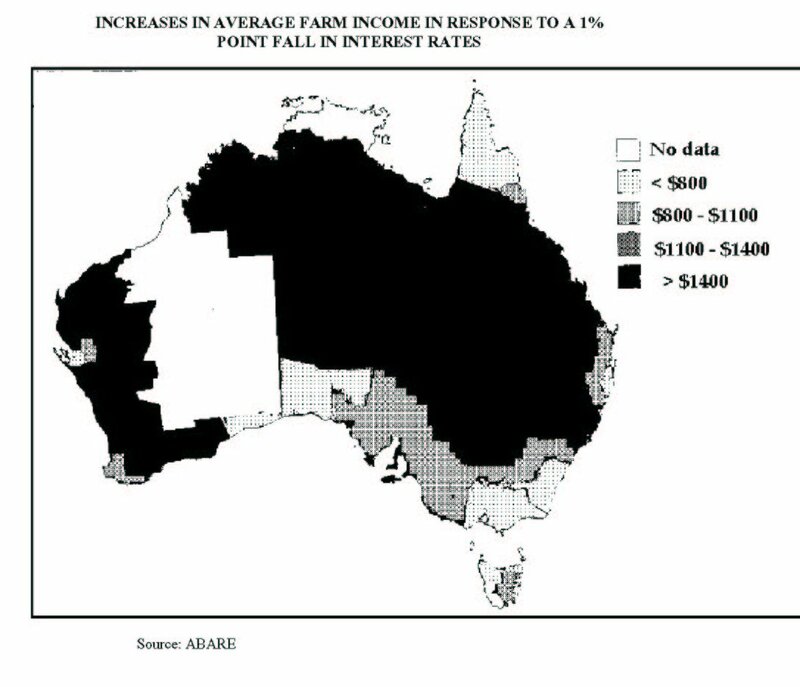 In general, farm incomes in the high rainfall areas of south eastern Australia are less affected by interest rates.